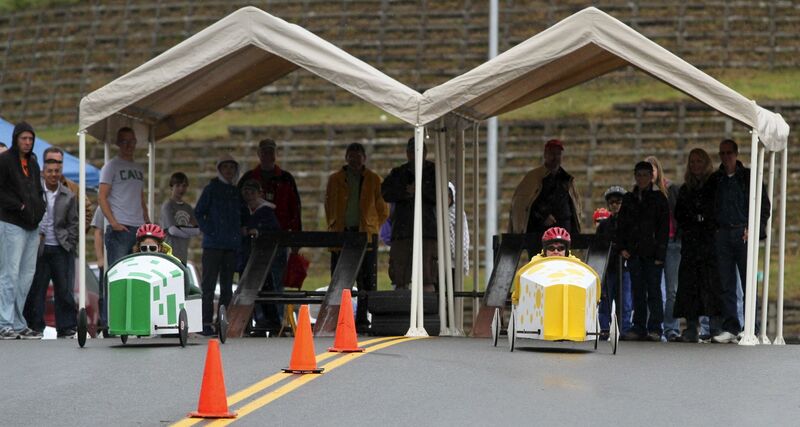 Fellow reporter Ed Friedrich had the good fortune to stand in the rain Sunday to cover the annual All American Soap Box Derby races on Dauntless Drive near Poulsbo’s Olhava development. 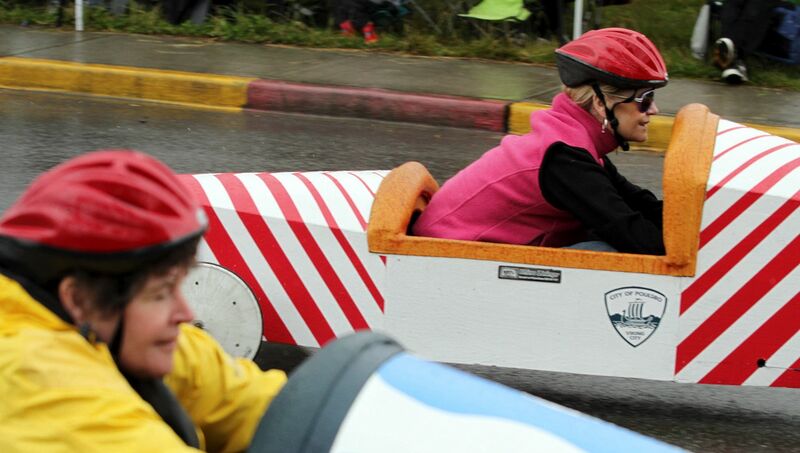 You may be wondering how youngsters competing to win a trip to Akron, OH to race in the derby World Championships is Kitsap Caucus-worthy (while there are race politics involved, it’s not the same kind of politics we usually write about here). Well here’s why: before the kiddos hit the streets, there was a friendly race between some well-known adults — Poulsbo Mayor Becky Erickson, Harrison Medical Center CEO Scott Bosch, Rep. Christine Rolfes, D-Bainbridge, and former Poulsbo Mayor (and defending soap box champ) Kathryn Quade. The race was the first time Quade and Erickson have faced off in a competition since last year’s election — and what a fun way to do it. Before the race Quade was giving pointers to Erickson, a first time oil can derby car race participant. Quade has competed before, as her reigning champ title suggests. She was telling Erickson to steer to the left, angling out near the cones which helps increase one’s speed. But Friedrich says Erickson may have taken the advice to the extreme, because during her first run the minute her car went off the ramp she steered sharp to the left, crashing into the curb. Quade joked with Erickson after the crash when she told her to go to the left she didn’t mean that much. In Erickson’s defense, the steering error was not a result of an inexperienced, or even overzealous, operator. In fact the steering cable (you know the thing that connects the steering with with the tires) was broken. She says she was heading left but as her path continued toward the curb she continued to pull the wheel to the right, to no avail. 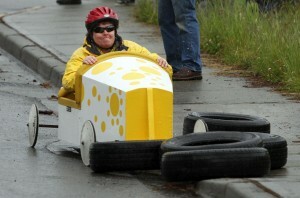 Luckily, though she crashed, she was not injured. So that she could get the real experience, Bosch volunteered his car so Erickson could try again. to hold on to her title of oil can champ. Congrats to the former mayor, and good job to all involved for being good sports — what a great lesson for the youngsters to see former competitors have a little fun with each other.